A lot of bad things can happen to the teeth. They can be chipped, cracked, broken, develop decay, or even go missing altogether! In any of these situations, the result can be an incomplete smile, dental pain, and a person who feels extremely self-conscious. At Yenzer Family Dental, we’re able to handle all of these problems using two of the most tried and true treatments in all of dentistry: crowns and bridges. Using high-quality materials, advanced technology, and an artistic hand, we can supply you with a restoration that will make it look like nothing bad ever happened to your teeth. If you’re ready to smile with confidence again, please contact us today. A dental crown is a tooth-shaped “cap” that simply fits over the top of a damaged tooth. Each one is custom-made, and it can be used to restore a tooth’s size, strength, and appearance all at the same time. Whether a tooth has been damaged by decay or injury, a dental crown can offer a relatively quick and complete solution. It even fully encapsulates the natural tooth to protect it from further wear and tear in the future. Crowns can be made of a variety of materials, ranging from all-metal to all-porcelain, and we’ll help you choose the one that best suits your needs. The process to get one typically takes at least two visits, at the end of which you’ll walk out of our office with a fresh, new smile! 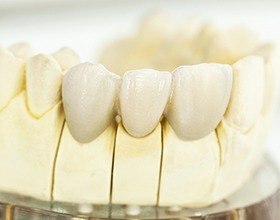 If you are missing a tooth or even three in a row, two crowns can actually be used to form a bridge and close the gap. Two dental crowns will be placed over the teeth on either side of the missing ones, and these will be bonded to prosthetic teeth to complete your smile. 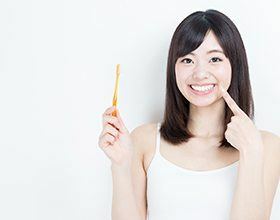 With a bridge, we’ll not only be able to bring back your smile’s appearance, but we’ll also improve your bite and prevent the remaining teeth from drifting into the gap (which happens often after tooth loss). Both crowns and bridges are placed over the course of two visits to our office. During the initial appointment, we prepare your teeth by removing any damaged tissues. We will also need to remove a small amount of surface enamel all the way around the tooth to allow the crown to fit within the natural smile line. 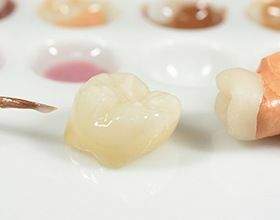 Once teeth are prepared, we capture impressions that will be used to craft your custom crown or bridge. Then, a temporary restoration is placed to protect your prepared teeth. When we receive your final restoration from the lab, we’ll exchange the temporary for this high quality, custom dental restoration. Once your dental crown is in place, you’ll be able to continue brushing and flossing as usual. You may want to make some changes to your oral hygiene products to avoid unnecessary dental wear. We recommend using soft or ultra soft bristled toothbrushes and minimally abrasive toothpaste. Waxed floss or water flossers may be beneficial to avoid pulling around the edges of your dental restoration. With proper care in our office and at home, your dental crown should last five to ten years. During your regular six month dental appointments, we’ll examine your crown for signs of wear. 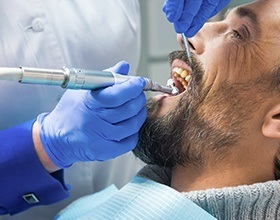 In most cases, we can make small repairs to ensure the longevity of your dental crown.